"How do I comb micro ring hair extensions?" 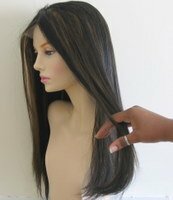 We get a lot of questions about combing and brushing micro ring hair extensions (also called micro loop hair extensions or micro bead hair extensions - and used interchangeably in this guide). The best way to think about brushing your micro loop hair extensions is to think about how you would brush or comb your natural hair and once you've thought of that apply two changes: slow it down and do it more gently. For those of you who love a step-by-step guide, below is a five step guide that is super easy to follow, but first we'll cover the basics of tools. "What brushes or combs should I use on micro ring hair extensions?" Soft bristle bushes. Don't use a brush with little balls at the ends of the bristles anywhere near the micro ring attachments as the balls can get caught in the actual micro rings and any tugging can cause the micro rings to become loose or slip off your hair. Detangling brushes and combs are best to use on straight micro link hair extensions. As you have more volume with your hair extensions, there is more possibility for tangling, so detangling brushes and combs are ideal. Wide tooth combs are great especially on wavy micro loop hair extensions and curly texture micro loop hair extensions. If you have straight hair extensions, you can also use combs with narrower teeth but ideally you should always start with a wider tooth comb and once the hair is relatively tangle free, move on to the narrow tooth comb. If you like, you can separate your un-micro ringed hair and tie that in a bun and comb that as you normally would. By keeping it separate you won't accidently run your comb or brush over the micro rings and end up pulling at the micro link bonds. For the first brushing or combing of the day, or as part of preparing your micro ring hair extensions for sleeping, it might be helpful to divide the micro ring extension areas of your head into sections - by doing this you can focus what you're doing on a smaller area which will mean less chance of accidently pulling at the micro link attachments. Slowly and gently run your fingers across each of the micro rings to make sure that they haven't become tangled over night or during the course of the day. Detangle the hair using your fingers. Always start at the ends of the hair and work your way towards the micro rings. Don’t pull or tug at any knots as you don’t want any of the micro beads to come loose. Hold a section of hair near the roots with one hand and comb or brush the ends with the other hand as this will reduce any strain on the actual micro ring bonds. Use your wide tooth comb or detangling brush and starting at the ends of the hair, gently and with a slower motion than you would use on your natural hair, brush or comb the hair working up towards the actual micro ring attachments. Gently tease out any remaining knots without tugging or pulling at the hair. "Am I supposed to brush near the actual micro loops?" Yes you are. You have to comb near to the actual micro rings because your natural hair has been pulled through the micro ring and your natural hair has to shed, brushing your hair helps with the natural and required shedding of hair. The micro ring hair extensions are secured to your own hair and when your natural hair sheds, the micro ring still holds onto it. If you don't brush your hair near the micro rings, the hair that has naturally shed will build up can become matted together with your hair that hasn't shed. Use a soft bristle brush near the micro rings and gently brush your hair in a normal downward motion (the soft bristle will glide over the actual micro rings and not get caught). The consensus is that we shed between 50 -150 hairs per day and this is normal because losing hair is part of the natural hair growth cycle. "How often should brush my micro link hair extensions?" You should brush or comb your micro ring hair extensions at least once a day but not really any more than three times a day as this can cause the hair extensions to shed. This three time limit includes when you style your hair in the morning and if you use heat styling tools on your micro link hair extensions, don't over comb the hair extensions as this can make them shed. If you plan on swimming with your micro link hair extensions then you should always brush the hair first. Obviously on the days that you wash your micro loop hair extensions (and therefore dry the micro loop hair extensions) you will comb the hair as part of the washing and drying process.